ISFPs, often called, “The Artists” or “The Composers” are known for being a combination of both dreamer and doer. These types are spontaneous and fun-loving but they are also guided by their deeply-held values and ideals. This article is going to discuss just a few of the things that really excite them. I hope you enjoy it! ISFPs fully engage their senses when listening to music. They use music for stress-relief, solidarity, connection, and romance. Whether they’re dancing to a favorite tune on the radio or strumming a tune on a guitar, music is a major satisfier for ISFPs. ISFPs are free-spirits who are gifted with a strong sense of adventure. They want to see all that can be seen and experience new sights, sounds, foods, and cultures. With their open-minded curiosity into human nature, traveling to distant lands is hugely appealing to them. Whether it’s scrapbooking, sculpting, or vlogging, ISFPs get a thrill from creating and crafting. They enjoy experimenting with a variety of different skills and putting a little of their own identity into each thing that they make. ISFPs hate being bound by a rigid routine or an overly-structured timeline. They enjoy looking at their day and knowing that they have ZERO plans or obligations. They enjoy being able to wander, experience, and enjoy life with spur-of-the-moment pleasures rather than planned-out responsibilities. Sinking into a bed of soft pillows and blankets for some much-needed shut-eye is a frequent satisfier for ISFPs. In fact, ISFPs are one of the most frequent types to use napping as a stress-relief technique according to the MBTI® Manual! Many ISFPs are enthusiastic animal lovers and feel a strong sense of kinship with their four-legged friends. In fact, according to Do What You Are, ISFPs are frequently found in veterinary career fields! 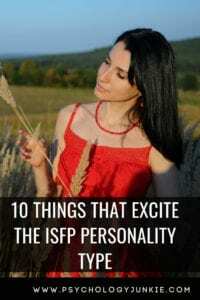 Curling up on the couch with a good snack and a new series to binge is a thrilling activity for many ISFPs. They enjoy connecting with new characters and engaging in thought-provoking stories all from the comfort and privacy of their own home. ISFPs are revived by being in nature, surrounded by trees, the ocean or glimmering starlight. These types like to feel connected with the plants, animals, and environments that are untarnished by industry and civilization. ISFPs are true connoisseurs at heart, and they tend to enjoy cooking, baking, or trying out new, decadent restaurants. They tend to be adventurous eaters and they enjoy trying a variety of different cuisines. ISFPs enjoy raw, thought-provoking conversation, preferably in a one-on-one setting with a trusted friend. They enjoy listening, giving feedback, and experiencing empathy and solidarity with others in a quiet, peaceful setting. Do these things bring you joy? Let us know in the comments!